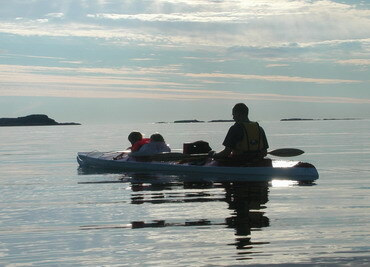 Both the baidarka and the King Island kayaks can be built for two or three people. They were built this way in the old days too, and this can have its advantages. If a family or two adults are going on a trip, and need a spacious kayak, this is the solution. The kayaks are fairly broad and therefore very stable. This can be an advantage when there are children in the kayaks. The long waterline gives them a very high top speed and makes the kayaks easy to paddle. Length varies from 590 to 680 cm (19'5'' to 22'3'') depending on whether the kayak is meant to be paddled by one or two adults. 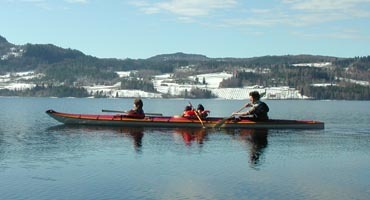 The triple kayak can also be used by two people, and the middle hatch can be used to load luggage.